Fetuses React To Face-Like Patterns : Shots - Health News Fetuses in the third trimester responded more often to patterns that resembled faces than patterns that did not. The findings don't mean fetuses can recognize their parents' faces before they're born. Fetuses in the third trimester responded more often to patterns that resembled faces than to patterns that did not. 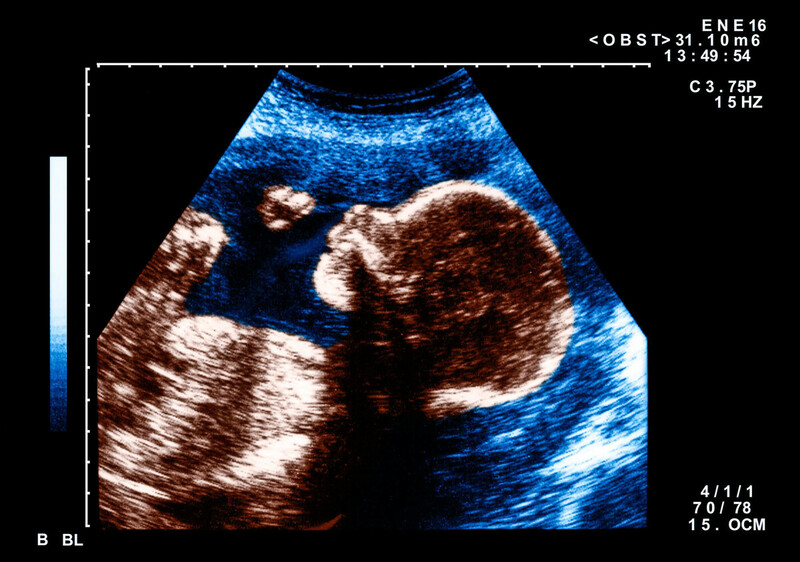 Provocative new research suggests that fetuses have the ability to discern faces when they're still in the womb. A study involving 34-week-old fetuses found they were more likely to focus on a pattern of lights that resembled a human face than on the same lights configured to look nothing like a face. While the results need to be confirmed by follow-up experiments, some researchers who were not involved in the experiment say the findings are a significant advance in understanding early human sight development. "I think it's fantastic," says Scott Johnson, a developmental psychologist at UCLA who was not involved in the research. "It's really a breakthrough. Scientists have long known that fetuses respond to sounds, such as their mother's voice and music. But it's always been a mystery how much they could see. "Vision really was the last of the sensory systems for us to understand," says Vincent Reid, a professor of psychology at Lancaster University in Britain who led the new research. "And that's because, until now, we haven't able to look at vision." But Reid thought scientists could use something he suspected would have the best chance of eliciting a response: faces. Scientists have long known that newborn babies are particularly drawn to faces. Reid wondered if that preference might start in he womb. So Reid and his colleagues created a very primitive representation of a face he could show to fetuses. "We call it face-like," Reid says. "It's not a face, but it has the same sort of parameters as a face, visually." It's three red lights glowing in just the right intensity red that a fetus can see shining through the mother's belly. Previous studies have shown that fetuses in the third trimester can see red light. The three dots of red light are arranged like an upside-down triangle. There are two bright red dots next to each other at the top and one at the bottom — oriented like two eyes and a mouth would be. Reid and his colleagues shined the patterns at the abdomens of 39 women in their third trimester of pregnancy and used sophisticated ultrasound technology to watch in real time how the fetuses reacted. "We moved the stimuli and then we tracked how the fetus would look at this," Reid says. In the journal Current Biology, the researchers report that the fetuses seemed to turn towards and follow the red dots more frequently and for longer than they did when the lights were flipped upside down and looked nothing like a face might. "You can actually see the face of the fetus. And then you can actually see them move their face," Reid says. "They would move their heads more to try to track the stimuli when we showed the stimuli in an upright orientation." While the overall rate at which the fetuses responded to either stimulus was relatively low, the fetuses were about four times more likely to respond to the face-like pattern, Reid says. Reid stresses the findings do not mean fetuses can recognize their parents' faces before they're born. "They can't see their mother's face. They can't see their father's face or someone else's face. And we don't want to recommend that people shine bright lights into the uterus, because that could be aversive. It could be damaging, potentially, if it was too bright," Reid says. And, while the differences were somewhat modest, other researchers say the results are nevertheless compelling. "Obviously a lot of development happens in the nine months before birth. So this paper for the first time gives us a window into some of those processes," Johnson says. For example, it could indicate when sensitivity to faces, which is probably crucial for bonding with parents, begins. "It kind of pushes down the age at which we know now that the developing human shows a socially relevant visual preference," Johnson says. "The visual system, in effect, kind of knows something about faces even before any exposure to faces at all. It's just astonishing to think about." Mark Johnson, a professor of psychology at Birkbeck College in London, calls the findings "noteworthy." "This study suggest the fetus's visual world might, in fact, be more interesting and contain more structure and visibility than we'd previously thought," Johnson says. "This new technique allows us to get a window into their visual world." And Reid and the other scientists say the same technique might help them learn other things about fetuses. Reid already has used the technique to find clues that indicate fetuses can differentiate between different numbers of objects. The technique could enable scientists to test whether fetuses can associate certain patterns of lights to other kinds of stimuli, such as specific nursery rhymes, says Mark Johnson. "This would be quite important because it would tell us that the ability of the brain to integrate information across senses is present very early on, even prior to birth," Johnson says.